Eating local is all the rage right now, and with good reason. When we eat fruits and vegetables grown near our homes and meats from animals raised near our homes, we’re supporting our local economy. Locally grown and raised food often comes from small farms that don’t use nasty pesticides. They treat their animals humanely. By choosing to eat locally, we’re choosing to support a more sustainable way of life. Try a sparkling wine or hard cider from Washington State this Thanksgiving. More and more restaurants are turning to small, local suppliers for their produce and meats. Increasingly, they’re serving local wines, beer, and even spirits, too. This is heartening for us small, independent producers of Washington State wines. This Thanksgiving, let’s be thankful for the bounty of Washington state. Let’s give thanks by being locavores. Let’s put as much on our tables that was grown, raised, and produced in Washington State as we can. The more local, the better. Fortunately, we don’t have to go without wine. Washington State Wineries produce some truly extraordinary wines and ciders. It will not be hard to find an appropriate local accompaniment to any Thanksgiving feast, no matter what you’re serving. 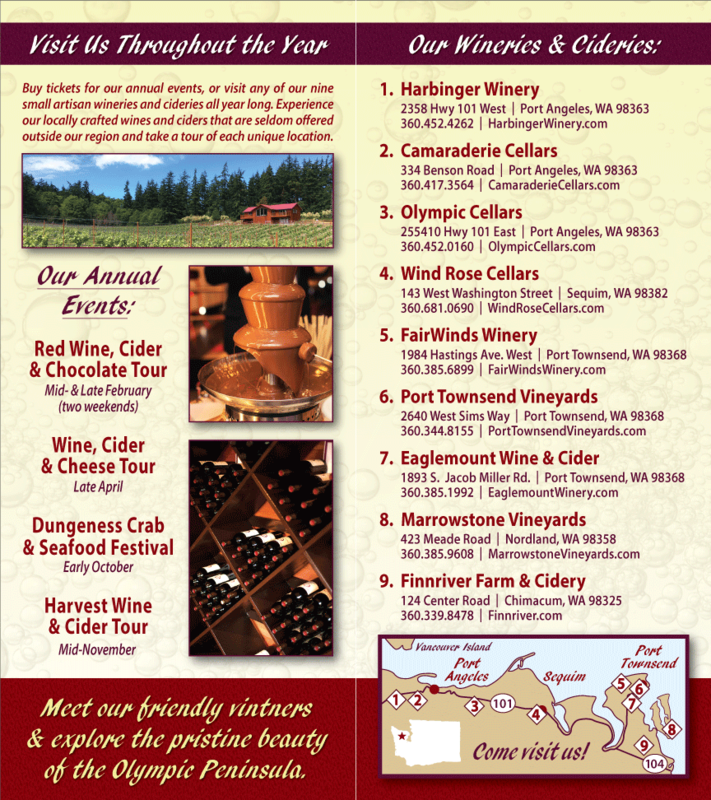 Many of you had the opportunity to sample a great variety of wines and ciders made by our member Olympic Peninsula wineries this past weekend, during the Harvest Wine Tour. If you did, there is a good chance you’ve already selected a few bottles of Washington State Wine or Cider to enjoy on Thanksgiving. If not, read on. Sparkling wines and cider go very well with Thanksgiving feasts, complementing both white and dark turkey meat, sweet dishes like yams, and just about everything else on the table. Finnriver Farm & Cidery and Eaglemount Wine and Cider have a lovely selection of ciders, including the awarding winning Artisan Sparkling Cider from Finnriver. FairWinds Winery of Port Townsend makes a mean Firewood Mead, which would be festive addition to Thanksgiving day. Syrah is an excellent red for Thanksgiving tables laden with turkey. Try the award winning 2008 Syrah from Camaraderie Cellars, or the award winning 2007 Syrah from Eaglemount Wine. Sorensen Cellars also has an excellent Syrah from 2006. White wine drinkers should consider serving the award winning 2009 Viognier from Harbinger Winery. The award winning NV Working Girl White from Olympic Cellars, which combines Chardonnay and Riesling, is another excellent choice. Try a mulled Syrah from Black Diamond Winery after dinner. It will be a perfect way to conclude a Washington State Thanksgiving Feast.